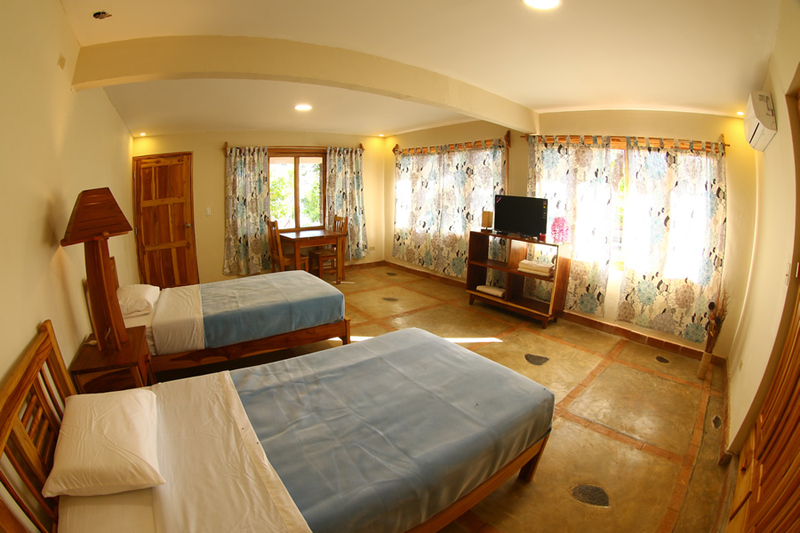 Each room has a terrace with teak furniture surrounded by tropical plants and flowers. 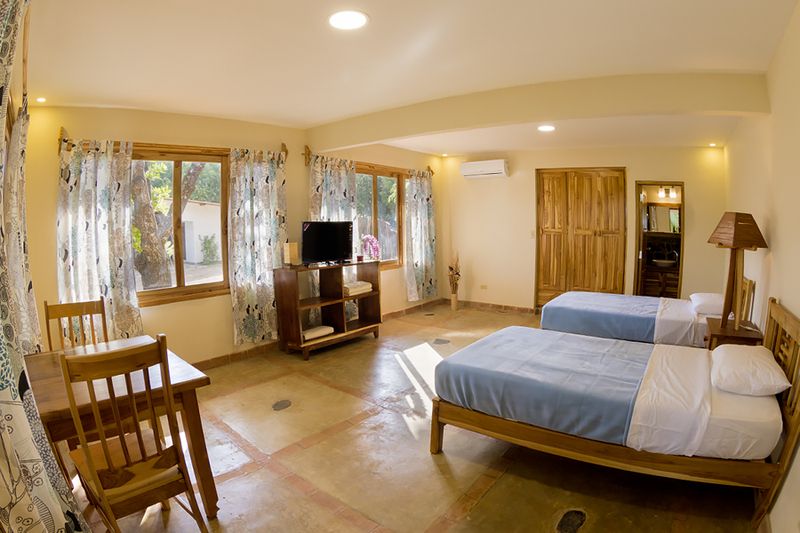 Hotel Playa Reina offers comfortable smoke free rooms with daily housekeeping and laundry service. 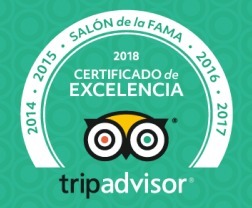 Our reception and concierge will attend your needs in any of the following languages: English and Spanish. 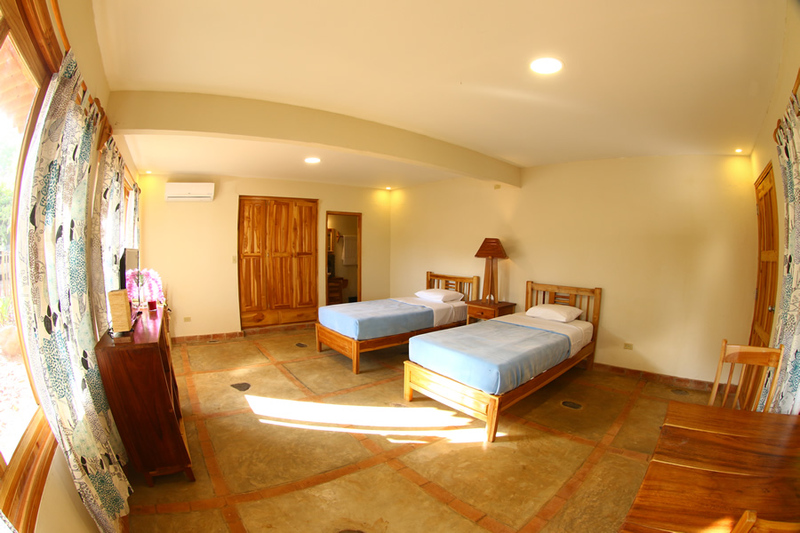 * All rooms include Air Conditioning. 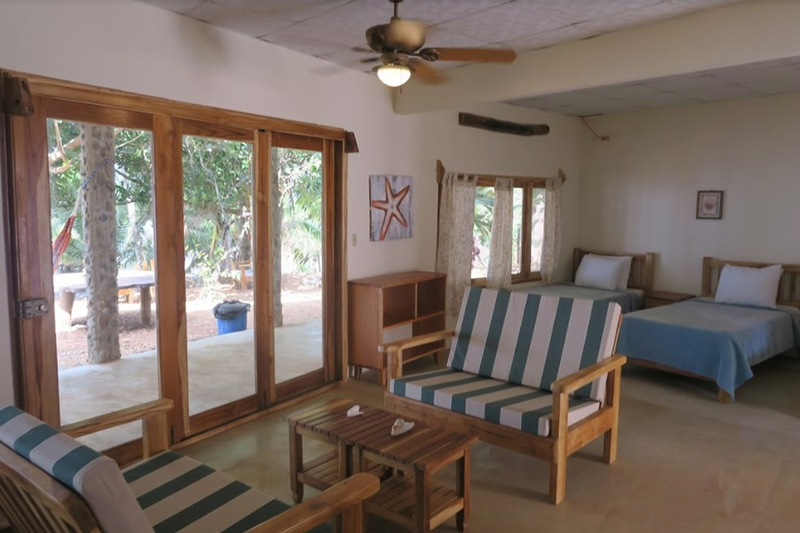 ** All suite rooms include minirefirgerador, satellite TV, private bathroom with hot water, hair dryer, safe, closets, terrace with chairs, table and hammock. *** All Private rooms include a private bathroom. **** The Dorm room includes a security locker for each bed. We have 4 double rooms with Sea View (19.48 m2), with capacity for 2 adults. 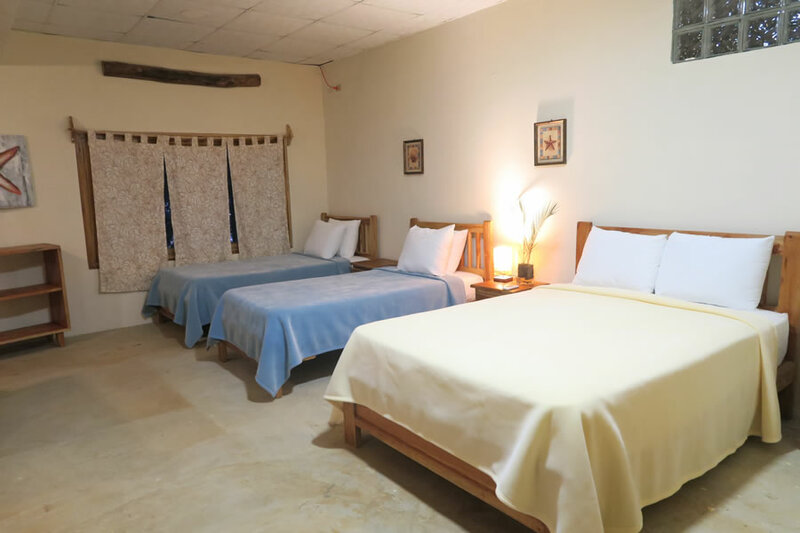 The rooms have 2 single beds. 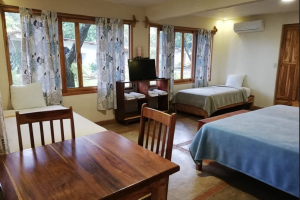 The rooms are equipped with satellite TV, closet with security safe box, mini refrigerator, air conditioning, and are decorated with handmade teak wood furniture. 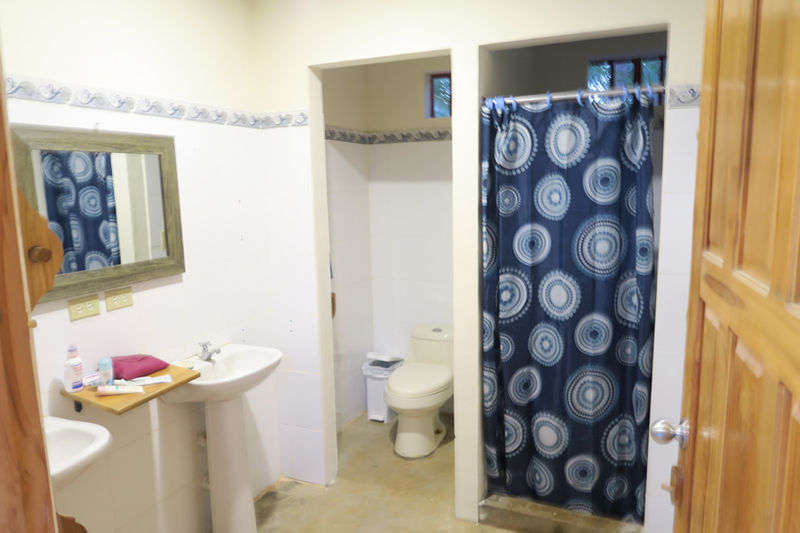 It has a private indoor bathroom with hot water, hair dryer, towels and toiletries. Terrace includes table, chairs and hammock. We have 3 triple rooms with Sea View (23.53 m2), with capacity for 3 adults. 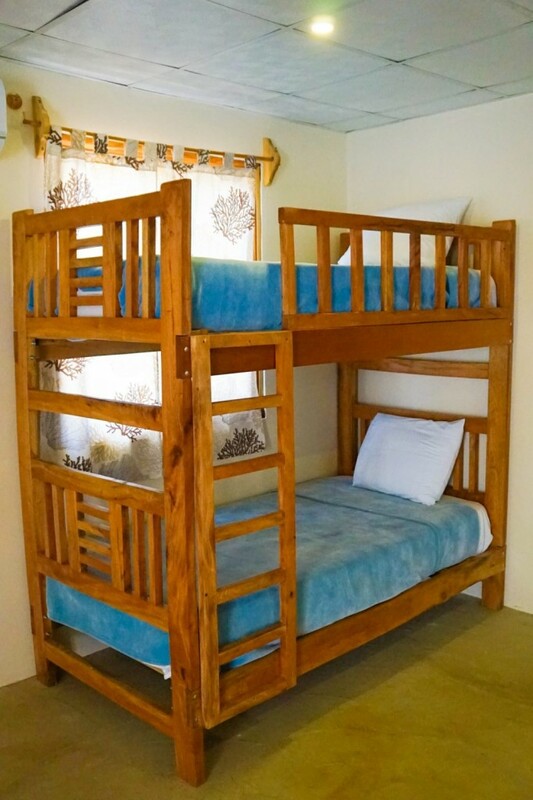 They have 1 King size bed and 1 single bed or 3 single beds. 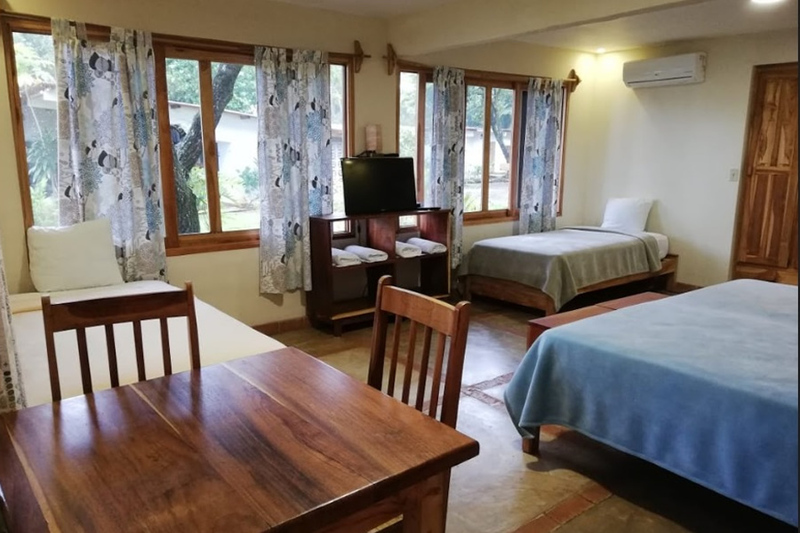 The rooms are equipped with satellite TV, closet with security safe box, mini refrigerator, air conditioning, and are decorated with handmade teak wood furniture. 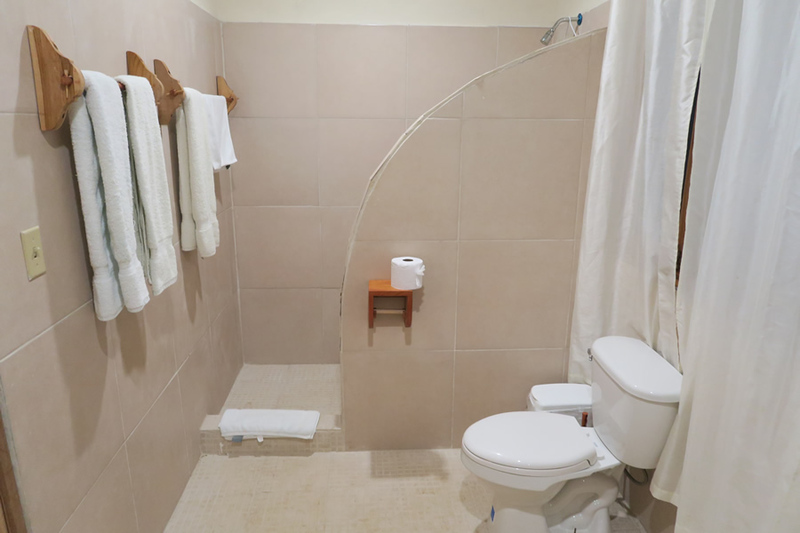 It has a private indoor bathroom with hot water, hair dryer, towels and toiletries. Terrace includes table, chairs and hammock. 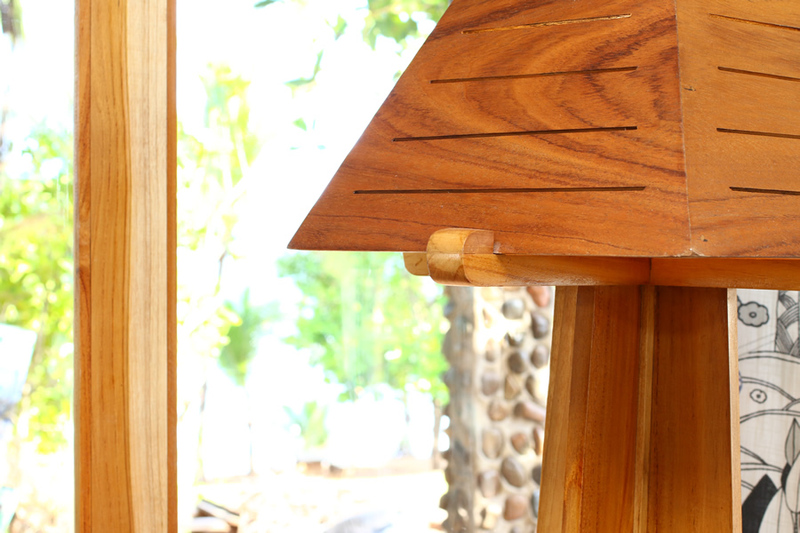 We have 1 cuadruple room with Ocean View, with capacity for 4 adults. The room can be arranged with 4 single beds, or 2 King size beds or 1 King and 2 single beds. 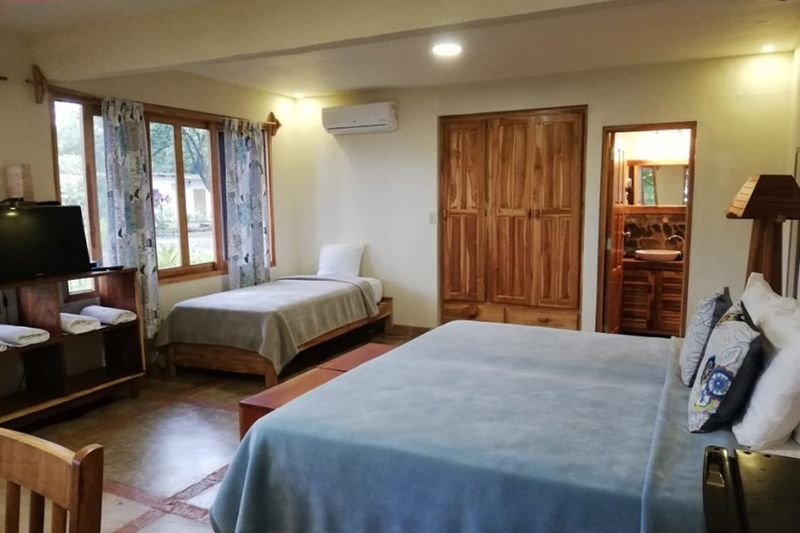 The room is equipped with satellite TV, closet with security safe box, mini refrigerator, air conditioning, and are decorated with handmade teak wood furniture. 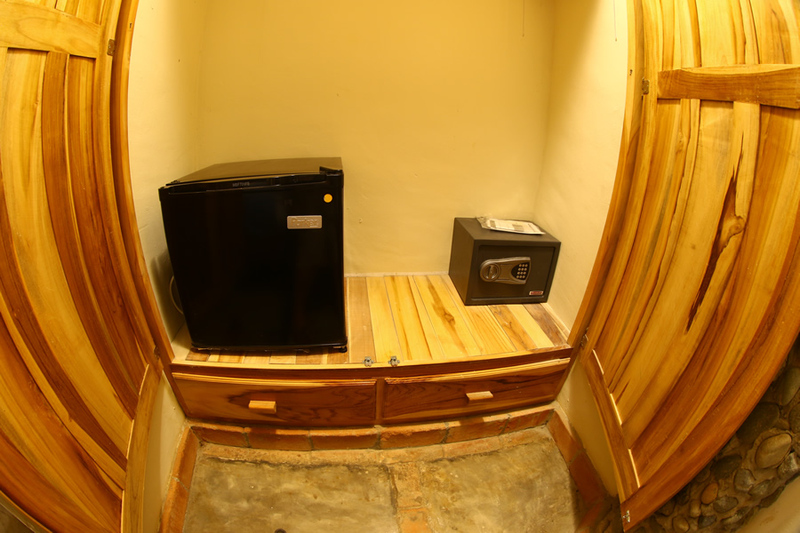 It has a private indoor bathroom with hot water, hair dryer, towels and toiletries. Terrace includes table, chairs and hammock. 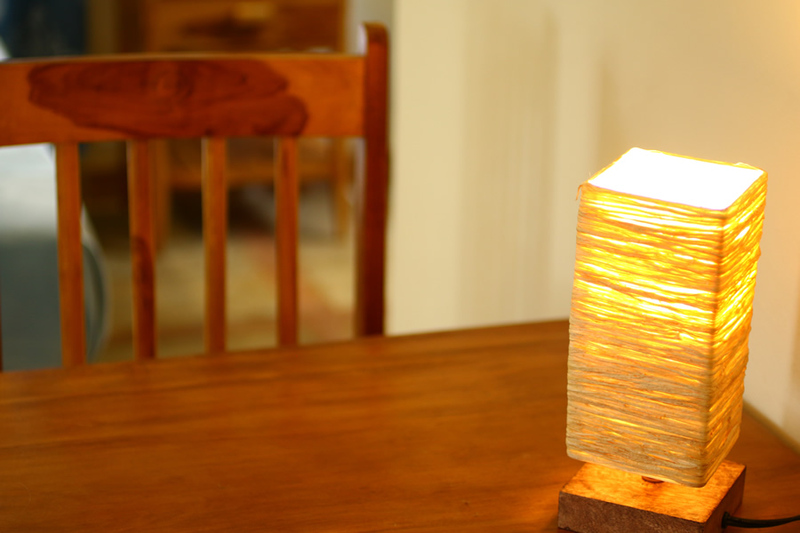 we have 1 large family room with sea view, with capacity for 4 adults. 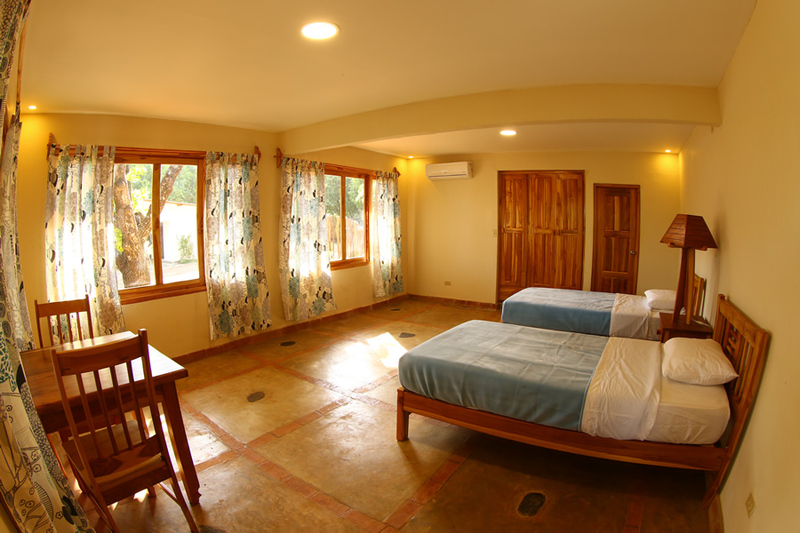 The room can be arranged with a double / full bed and two single / twin beds or a double/full bed and a King size bed. 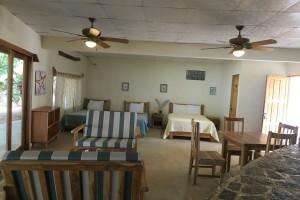 Equipped with refrigerator, microwave, coffee maker, kitchen / open bar area with bar stools, dining room with table & 4 chairs, kitchen utensils, stove top with 2 cooking ranges, Air Conditioning, fans, terrace with table chairs, hammocks, 1 private full bathroom with shower, and 1 private half bathroom with no shower. 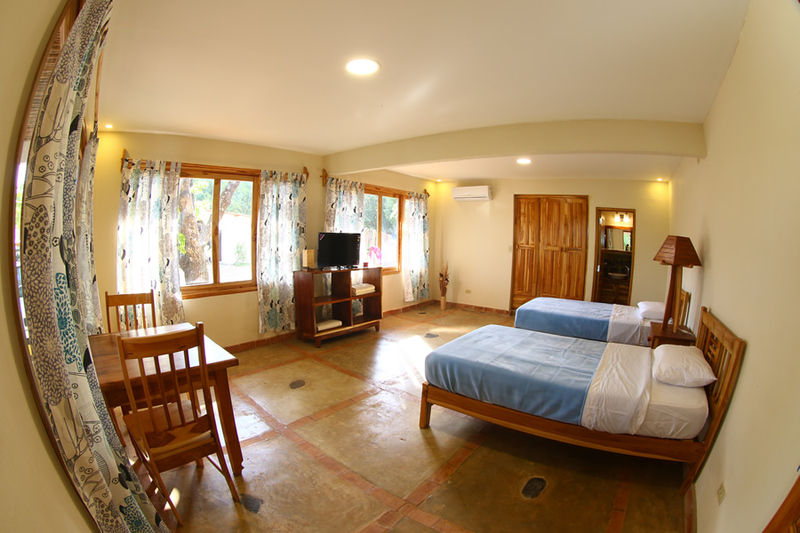 STANDARD DOUBLE WITH OCEAN VIEW: We have 2 standard rooms with ocean view, with capacity for 2 adults each. 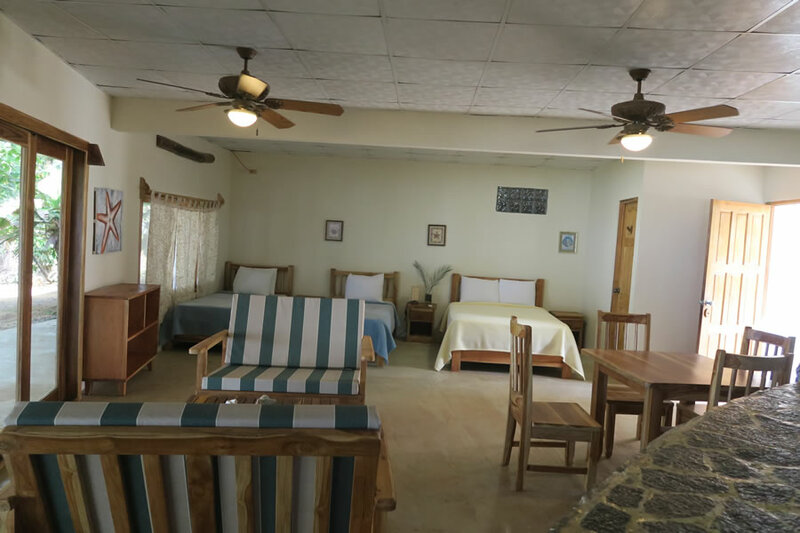 The room has a double / full bed, private bathroom, ceiling fan and Air Conditioning. STANDARD DOUBLE WITH NO OCEAN VIEW: we have 2 standard rooms without ocean view, with capacity for 2 adults. 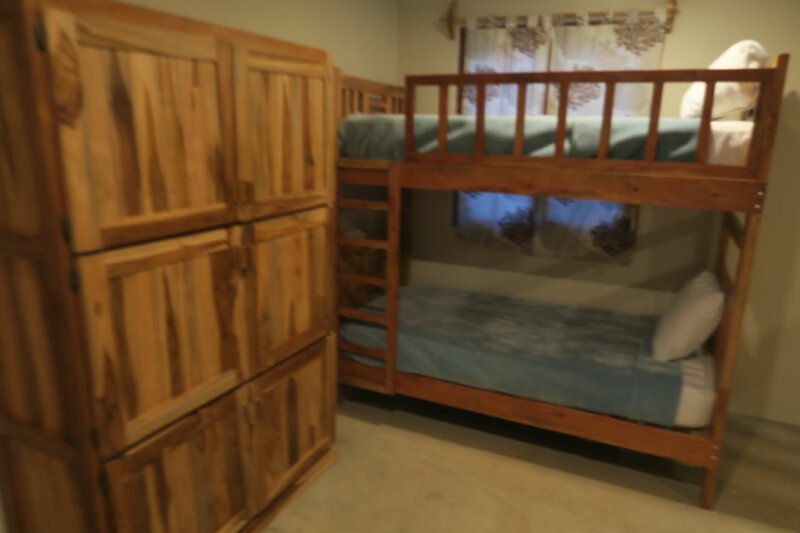 The room has a double / full bed, private bathroom, ceiling fan and Air Conditioning. STANDARD DOUBLE WITH NO WINDOW: We have 1 room, with capacity for 2 adults. 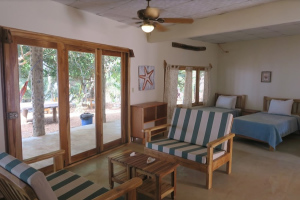 The room has a double / full bed, private bathroom, ceiling fan and Air Conditioning. STANDARD DOUBLE TWIN SHARED BATH: We have 1 room equipped with 2 single / twin beds, with capacity for 2 adults. The room has a ceiling fan and Air Conditioning (the bathroom is shared). 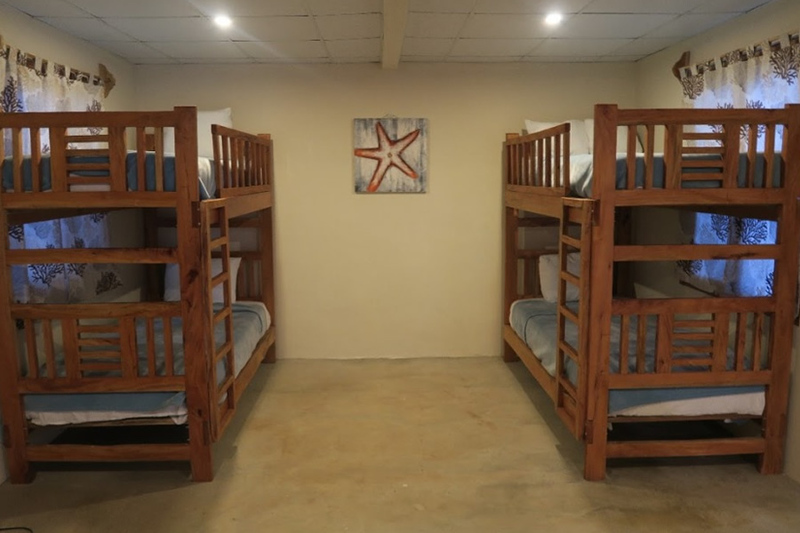 SHARED DORM ROOM: The Dorm Room has 6 single / twin beds that are top and bottom bunk style, with capacity for 1 adult person in each bed. 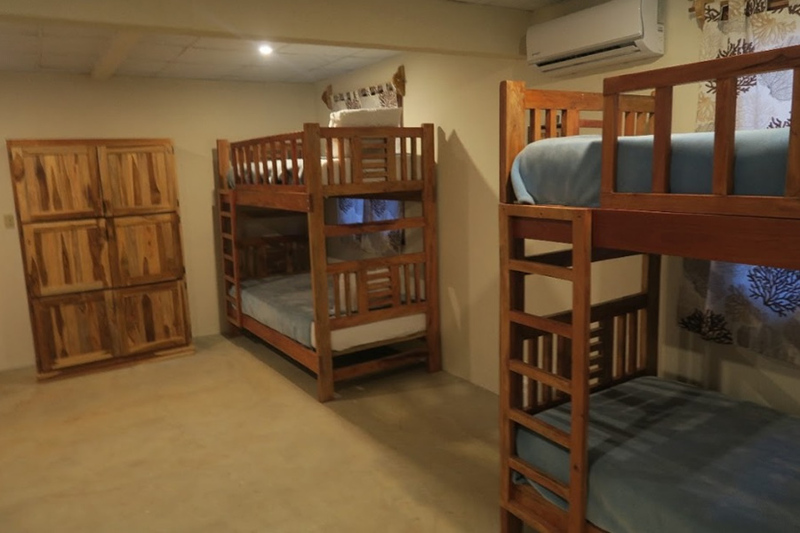 The dorm room has 6 lockers to store each persons belongings and Air Conditioning. 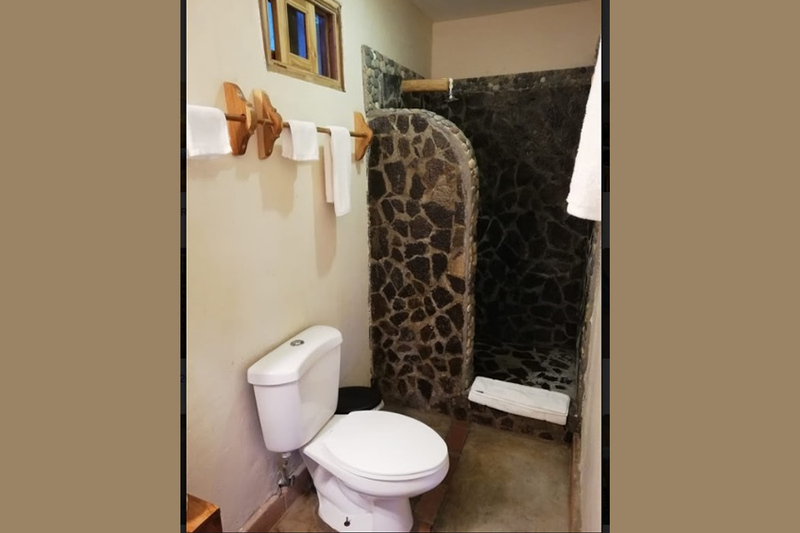 It has a shared bathroom with sink, shower and toilet.